Effivet Skin and Wound Formula is an effective non-toxic, antimicrobial solution which works with the immune system of your pet to fight infection and speed up healing. Suitable for a full range of animals, Effivet Skin and Wound can be used to moisten, clean and debride wounds without harming healthy tissue. It is also pH neutral and free from steroids and antibiotics, so it won’t sting or irritate the wound. The ready-to-use spray works by doubling the oxygen supply at the wound site and killing 99.9% of bacteria, viruses and fungi within seconds, reducing inflammation and eliminating odour. 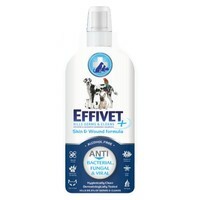 Effivet Skin and Wound Formula will also provide targeted relief from scratching, insect bites and hot spots. It can also be used to clean the ear and eye lid area.